The shooting death of three officers in Baton Rouge, Louisiana this weekend shone a clear light on how America's gun epidemic is not only affecting innocent civilians, but law enforcement as well. 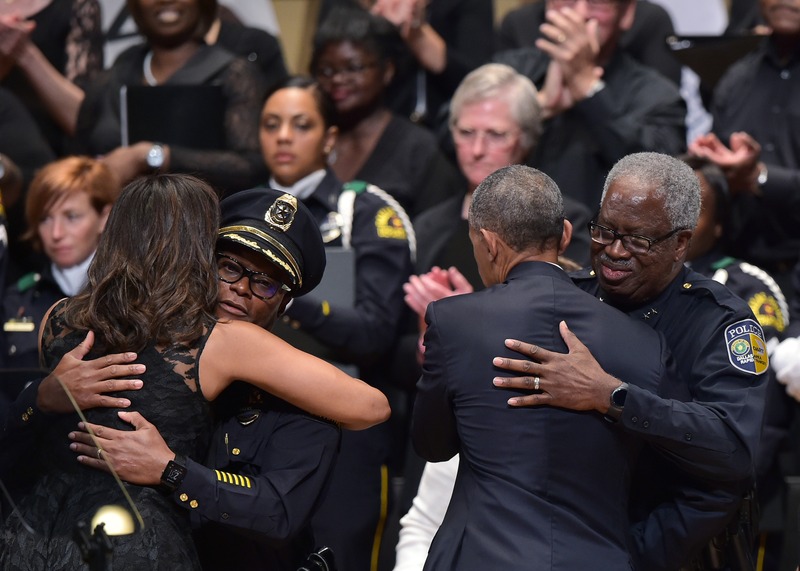 Word of the tragic killing comes as the country is still reeling from the officer-involved deaths of Alton Sterling and Philando Castile, two black men killed at the hands of police this July, and the killings of the officers in Dallas that followed. Tensions between officers and the communities they serve following these deaths have been high, but it's important to note that — despite often being the ones to pull the trigger — officers die from guns at an alarming rate, and are also victims of America's complicated and repeatedly inflexible relationship with firearms. According to a report by CNN, the killing of officers Montrell Jackson, Brad Garafola, and Matthew Gerald push the number of gun-related deaths of police up to 31 so far this year. That harrowing statistic has shot up dramatically since last year — as of July 17, 2015, gun-related deaths accounted for only 18 of 62 law enforcement fatalities. According to the National Law Enforcement Officers Memorial Fund, which tracks data on officers killed on duty, this means that gun-related deaths for officers are up 72 percent as compared to this time last year. This also means that gun-related fatalities make up nearly 50 percent of all law enforcement deaths this year. It is a deeply troubling statistic that more widely reflects America's problem with guns, and particularly, the gun lobbyists that continuously demand that firearms only be taken from "cold, dead hands." It would be amiss to place the blame in anything but a culture that fanatically advocates for the rights of guns over the rights of people. Conservative politicians were quick to center the blame for this month's Dallas shooting that left five officers dead on Black Lives Matter, and the National Rifle Association's statement on the tragedy in Dallas only emphasized the "right of law-abiding Americans to carry firearms for defense of themselves and others," failing to mention the officers killed in the line of duty at all. Similarly, the NRA's statement on Philando Castile only cryptically spoke of "troubling" news out of Minnesota, and did not use Castile's name once. True to form, NRA officials are known for their tone deaf speeches in the aftermath of tragedies, sometimes conflicting with their own members' opinions on the matter, according to The Washington Post. ThinkProgress has outlined the NRA's repeated attempts to stronghold any movement on gun safety measures in the wake of mass shooting after mass shooting. And even in the case of someone like Castile, a law-abiding citizen with a gun permit, the NRA has trouble speaking up despite his story aligning with their own narrative. That is because, by and large, groups like the NRA seem to advocate for guns in the abstract, instead of for the people who carry them. Therefore the rising number of shooting deaths, including the lives of the three officers senselessly taken on Sunday, can be blamed not on groups like Black Lives Matter, but on a culture that continuously upholds guns before people and the organizations that zealously back that culture.